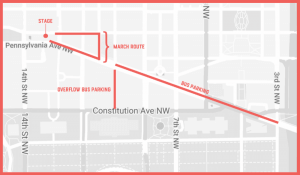 This weekend, on the second anniversary of the 2017 Women's March on Washington, women, men and families will march again on our nation's capital and in cities across the country. The mission: To send a message to the Trump administration and Congress that women's rights are human rights and that oppression of individuals based on their ethnicity, gender, disability or country of origin is unacceptable and a violation of our civil rights. The Women's March on Washington ushered in a wave of political power that has since inspired millions to vote, hundreds of women to run, and swept dozens of women into elected office -- all ready to lead transformative social change. Forward to help keep the march organized, safe and successful! The location has changed! 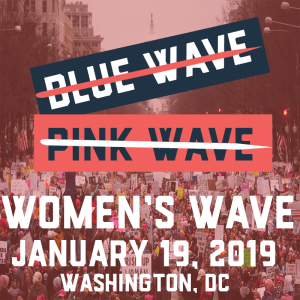 Check out important new information and logistics on the #WomensWave Rallies this Saturday, January 19th. 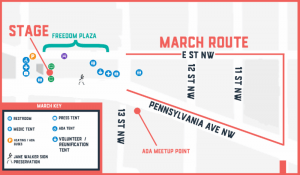 The WomensWave March is sponsored by the ACLU, Planned Parenthood and the American Federation of Teachers, and is led by the Women's March National, the organization and movement that grew out of the historic 2017 event that drew 600,000+ participants in Washington, DC, and over a million more in 650 marches worldwide. They are joined by over 200 partner organizations, unions and companies, including DemList! Speakers include: Scarlett Johansson, America Ferrera, Randi Weingarten, Ashley Judd, Cecile Richards, Roslyn Brock, Gloria Steinem, Michael Moore, George Gresham, Van Jones, Maryum Ali, Amanda Nguyen, Melissa Harris-Perry, Judith LeBlanc, Sophie Cruz, LaDonna Harris and others. Find a Sister March in your City or Country! Info: https://www.wmata.com and to buy cards in advance: https://smartrip.wmata.com/storefront. American Sign Language (ASL) interpretation will be provided; picture-in-picture and CART in English available on the North jumbotron, and Spanish language translation on the South jumbotron.